You really can't go wrong with a raisin muffin flavored with cinnamon and nutmeg. A little bit of nutmeg is really all you need, but it will add a nice, spicy fragrance to the muffins. You could also substitute ground cloves. The key to making great muffins is not overmixing the batter. Once the liquid ingredients are added to the dry, mix the batter by hand just until the flour is moistened, for no more than about ten seconds. 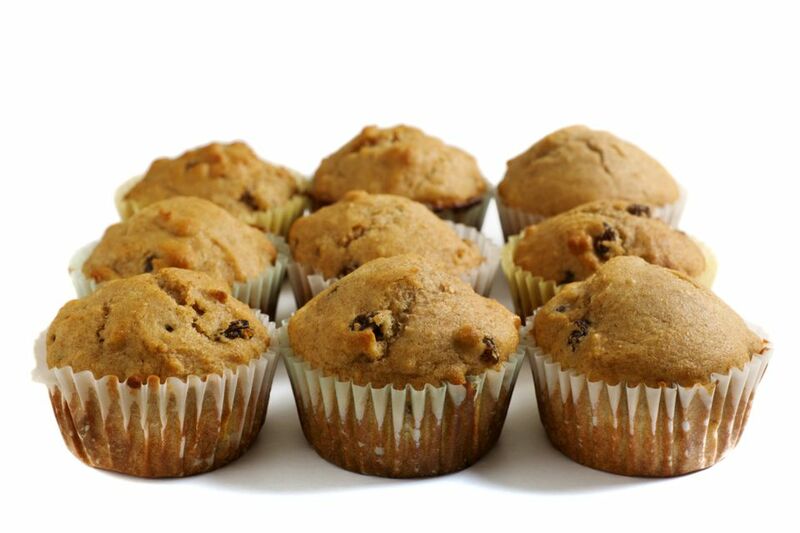 Too much mixing can cause the muffins to be dry, tough or misshapen. Also, make sure your baking powder is fresh. If it's older than six months (or if you can't remember how old it is), buy a new container. Finally, if you want to spruce your muffins up a little bit, here's a recipe for a simple streusel topping you can mix up in just a few seconds. Combine the flour, baking powder, salt, cinnamon, and nutmeg. Unwrap the butter and heat it in the microwave, in a microwave-safe bowl, for about a minute, until it's thoroughly melted. Set it aside at room temperature to cool, but don't let it solidify again. Beat the eggs in a separate bowl and then add the sugar, milk, raisins and vanilla to the eggs. Thoroughly grease and flour a muffin pan (or use paper muffin liners). Note: Don't add hot melted butter to the egg mixture as the heat from the butter would cook the egg, and that's not what you want to do! Quickly spoon the batter into the prepared muffin pans and bake immediately.